“In the Mantrayana, there is the superiority of the skilful means of bliss, (which is) the subject, (and) there is no difference (between the Mantra and Paramitayanas) in terms of the object, (emptiness), free of elaboration; this is the Rangtong system. “In the Shentong system, the object (emptiness) is not the mere freedom from mental elaborations; it is asserted to be endowed with the supreme of all aspects, like (the images appearing in) a mirror divination. How is the relationship between the Rangtong and Shentong schools explained in the Tantras? What is the Madhyamaka view in the Tantras of Mantrayana, which is also called “Vajrayana”? There are different masters and each one has an own way of explaining the view that is presented in the Tantras. The major consensus is that the Tantras correspond with the Third Turning of the Wheel of Dharma by the Buddha. Jamgon Kongtrul Lodrö Thaye wrote that most scholars who composed the ancient Indian texts agree on this point but that Tibetan scholars had their own opinions about this. Followers of the Rangtong school teach that the subject of the Tantras is great bliss, i.e., great bliss is the means to realise emptiness and freedom from conceptual fabrications. This approach is not different than the approach taught in all versions of the “Prajnaparamitasutra.” The Rangtongs say that when it comes to the object, Tantrayana and Sutrayana are alike. Other masters say that the teachings on emptiness in both Yanas are not alike. They argue that in Tantrayana emptiness does not denote nothing, rather, that emptiness possesses aspects. It is important to understand that there are slight differences between Sutrayana and Tantrayana. Once somebody told me, “When looking at the Buddhist teachings that are being presented, then there are teachings on emptiness, calm abiding meditation, love, compassion, and so on. This is very good, but when it comes to Buddhist practices, they are different. In monasteries, drums are beaten, horns are blown, there are strange deities, some look peaceful and others look wrathful. One doesn’t actually see Buddhists practice what they are teaching.” It is true. This is how it appears to newcomers. And so, for this reason, it is important to understand the difference between Sutrayana and Tantrayana. The aim of all Buddhist practices is to attain wisdom by realising the true nature of all things. In the Tibetan tradition, the method of practice is Tantra, which consists of the path of liberation and the path of methods. While engaging in the path of liberation, a practitioner looks directly at his or her mind and gradually realises its true nature. In the path of methods, a practitioner is not just concerned about realising mind’s true nature but engages in various methods to increase their mind’s stability and clarity. That is why there are the practices of meditating on deities. The aim of meditating on deities is to realise dharmadhatu, i.e., the indivisibility of emptiness and the clear manifestation of wisdom, and in that way to attain Buddhahood. A meditation deity, called “yidam” in Tibetan, is not seen as a truly existent, external entity, rather, it is seen as an aspect of our mind, i.e., an aspect of our Buddha nature. During meditation, a practitioner of Tantra imagines that his or her body, speech, and mind are not their ordinary impure body, speech, and mind, but that they are the pure body, speech, and mind of the yidam. As described earlier, we need to overcome and eliminate our obscurations of the defilements and of knowledge. We can naturally overcome these obscurations by meditating that our body, speech, and mind are the pure aspects of the yidam. During meditation practice, we imagine that we are the yidam. We imagine that light radiates out from our pure heart and invites all wisdom aspects of that deity to merge into us. We imagine that they do and thus experience that our perceptions are purified. For example, our perception of sound from drums and gongs that we usually think are disturbing or unpleasant, our perception of scent from incense that we usually think is unpleasant, and so on, are purified. The various instruments are aids that help us during meditation. We also purify our speech by repeating the sacred Mantra of the yidam that we are practicing. Mantras are not words that we are accustomed to in daily life and usual conversations, so repeating them in original Sanskrit is much more inspiring and supportive. There are the Rangtong and Shentong traditions. It is said that the view taught in the Tantras is the same as that of Shentong. The Rangtong school is best for analysing phenomena and realising emptiness. But understanding emptiness does not suffice to attain complete realisation. The Shentong view is best for meditating the presence of mind’s wisdom and clarity and therefore most beneficial for Tantra meditation. It is often said that the “Uttaratantrashastra” that Buddha Maitreya transmitted to Asanga joins Sutrayana and Tantrayana. This is the reason Jamgon Kongtrul Lodrö Thaye wrote that the view in Tantra is the Shentong view. Followers of the Sutra tradition practice to realise emptiness that is free from conceptual fabrications. This goal is attained by analysing the two types of no self. Without seeing the true nature of things directly, practitioners can come to the conclusion, “Yes, phenomena are devoid of an own nature. Their nature is emptiness.” But, having gained certainty, it is necessary to meditate on the basis of that certainty, until it becomes clearer and clearer. When the nature of phenomena is directly seen, a practitioner has reached the first level of enlightenment, the first Bhumi of a Bodhisattva. So, Sutrayana teaches that there are appearances and their true nature is emptiness, i.e., appearances and emptiness are indivisible. The Rangtong tradition teaches that clarity and emptiness are indivisible. The Shentong and Tantra traditions teach that emptiness and bliss are indivisible. In the tradition of Tantra, methods are taught in which the physical body is employed. There are channels that run through the body, air or wind that flows through the channels, and the chakras or vital points in the channels. By practicing correctly, warmth develops and pervades the chakras and channels. This warmth brings bliss throughout the body. It would not be beneficial to be attached to this bliss. Instead, we should see that the nature of bliss is emptiness. It is easier to recognize bliss than emptiness, so by creating bliss that pervades our entire body and by recognizing its true nature, we realise the union of bliss and emptiness. There are also the methods called “complete grasping” and “subsequent destruction or disillusion.” Complete grasping means realising the union of bliss and emptiness perfectly and fully. Subsequent destruction or disillusion means merging everything into emptiness. Lama Gargyi Wangpo, who is also known as Chökyi Jungney, was the Eighth Tai Situ Rinpoche. He established these Vajrayana methods of practice. “If (Buddha nature were) not present in the basic nature, it could not (possibly) come about as a result of looking (through analysis based on reasoning and scripture, or through conceptual meditation). “When emptiness is (directly) realised, (primordial wisdom, which is not deluded about) cause and effect, is spontaneously present. In this section, Jamgon Kongtrul Lodrö Thaye wrote about the view of the union of that which is unborn, of appearances and emptiness, of clarity and emptiness, and of bliss and emptiness. If we ascertain the view, then we will have attained realisation of the true nature of all things. This could not be realised if the true nature of all things were not the union of appearance-emptiness, and so on. For example, charcoal is black in color. If charcoal is washed 100 or more times, it would stay black and could not become white. Likewise, no matter how much we practice, it is impossible to realise emptiness and so on if it were not the nature of phenomena. The Buddha and great masters taught about the true nature of phenomena on the basis of their direct realisation and not because of their textual scholarship or philosophical reflections. It would be impossible for us to attain the same realisation if they had been mistaken or if they were wrong. Since the true nature, emptiness, is true, we can realise that they were right and through practice attain the same result. How is the result attained? By developing three types of wisdom. They are: (1) wisdom gained from hearing the teachings; (2) wisdom gained from contemplating them; and (3) wisdom won from meditating them. We first need to develop the wisdom that arises from hearing and reading the words spoken by the Buddha that are recorded in the Sutras and from reading the explanatory texts that were composed by great Indian and Tibetan masters. Is it enough to know what was taught? No. We also need to contemplate the teachings so that we understand the meaning. Thus we come to know, “This is what is meant by emptiness. It is the same as the nature of phenomena.” In that way, we attain the wisdom that arises from contemplating the teachings. Is it enough to know what the teachings mean? No. We also need the wisdom that is won through meditation. For example, a pain that we feel does not stop by reading or contemplating that all things are emptiness. Just knowing that the true nature of all things is emptiness does not put an end to a pain. We need to gain experience through meditation that is based upon knowledge. When we have attained direct realisation of the ultimate truth through meditation, we will also have realised the relative truth of all appearances and experiences. Jamgon Kongtrul Lodrö Thaye wrote in the verse of this section: “When emptiness is (directly) realised, (primordial wisdom, which is not deluded about) cause and effect, is spontaneously present.” This does not mean that appearances and experiences are seen to have no cause and that when we have realised that the true nature of all things is emptiness, then things mean nothing to us. Rather, this means that the obscurations that move us to believe in an individual self and a self of phenomena have been eliminated. Then, being free from the ignorance of not appreciating and acknowledging the workings of karma, the wisdom that realises the relative truth of causes and effects is naturally present, i.e., we know that negative karma engenders painful results and positive karma engenders good results. Appearances and experiences of relative reality arise unceasingly, therefore, while apperceiving them, we realise the ultimate truth, namely, that their true nature is unborn. 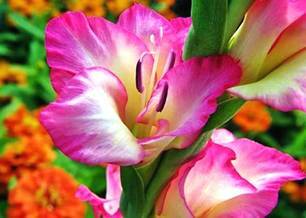 Realisation of the ultimate truth does not prevent us from apperceiving the relative truth or vice versa. Rather, while realising the relative truth of phenomena that continually arise and that we experience, we realise the ultimate truth, that all things we apperceive are empty of a true nature. When the ultimate truth of phenomena is seen, delusive cognition of relative realities has been overcome and we see both the indivisibility of the relative and ultimate truths. As a result, we are not distracted, our mind is no longer unstable, and we will have realised the union of wisdom and means, which is Prajnaparamita, ‘the perfection of wisdom.’ Because Shravakas, Pratyekabuddhas, Bodhisattvas, and Buddhas are born from wisdom, often Prajnaparamita is referred to as “The Mother.” Whether we call realisation “the perfection of wisdom,” or “Prajnaparamita,” or “Mahamudra,” it is realisation of all teachings that are presented in the Sutras and Tantras. This concludes the seminary on chapter 7.3 of “The Compendium of Knowledge” that was composed by Jamgon Kongtrul Lodrö Thaye the Great. Karma Lodrö, splendour of the teachings, may you remain steadfastly present, your qualities of the glorious and good Dharma spreading as far as space can go. May your activity of teaching and practice be universally victorious, and may the magnificence of this triumph blaze forth. In the heavenly realm of Tibet, the source of all happiness and help for beings, is Tenzin Gyatso, Chenresig in person. May his life be secure for hundreds of kalpas. -- The title photo on this page is courtesy of The Himalayan Art Resources. 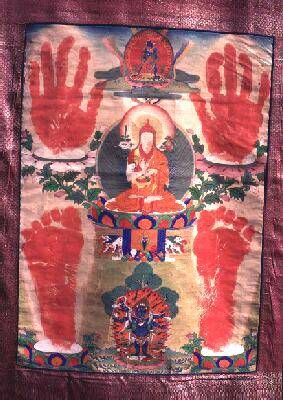 There it is written that Jamgon Kongtrul Lodrö Thaye is depicted at the center of this Thangka. Furthermore, that he is "(...) accompanied by his hand and foot prints. An inscription on the back of the painting states that it was commissioned by the Tantric student Tashi Chopel when Kongtrul was 85 years old, a year before the passing of Kongtrul in 1899." -- The translation of the teachings that Khenchen Thrangu Rinpoche presented in Tibetan were simultaneously translated into English by Peter Roberts. The Root Text, “Gaining Certainty about the View,” was translated under the guidance of Khenpo Tsultrim Gyamtso Rinpoche by members of the Marpa Translation Committee and was published in Kathmandu, Nepal, by Modern Printing Press Ltd., in 1994. The teachings of this seminary were transcribed & edited from the recordings by Gaby Hollmann in 1996 and in 2013 the manuscript was edited again & revised for the Dharma Download Project of Karma Lekshey Ling Shedra, Nepal. This rendering is for personal studies only; it may not be published anywhere else and it may not be translated into another language without prior permission from everyone mentioned here. Copyright. – May virtue increase!